Nusantara Theme is designed for use by all wordpress user with drag and drop element, whether newbie or a professional who wants the ease of customization without the need for coding expertise. Nusantara Theme an elegant design flexibility of it’s use and attractive. You can be free to be creative with 6 different responsive design homepage, color, header, font, CSS3 text-shadow, CSS3 box-shadow, rounded corner, page templates, unlimited slider effect, and much more. You can be free to customize the layout without having to open the theme file, reset button is also available if you want to go back to the default layout. 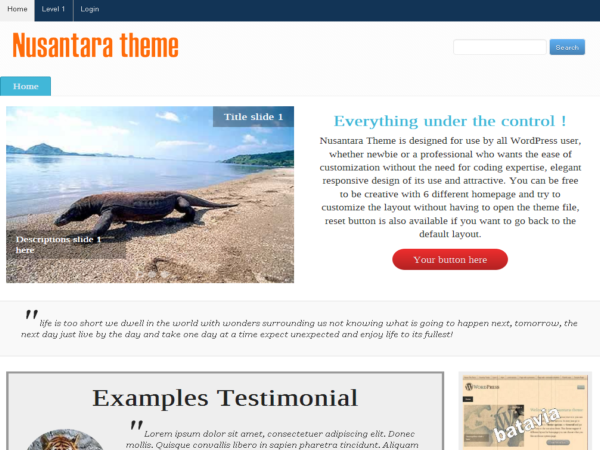 Nusantara theme is perfect for all wordpress user and theme developer who wants create premium theme from the scratch.